Green building of the week is this french high school with a dramatic green roof - Stunning Green Roofed High School by Off Architecture. 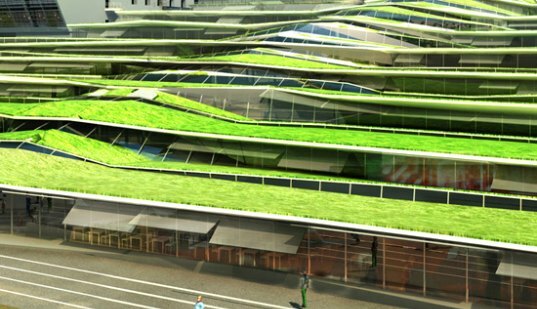 High school students in Revin, France will soon be attending classes in a stunning new terraced building covered in green roofs. Seen from above the new Lycee Jean Moulin school will simply appear as a terraced landscape, practically disappearing into the hillside. Designed by Paris-based, Off Architecture in association with Duncan Lewis Scape Architecture and Jeans Giacinto, this green roofed marvel is curvaceous and organic, blending into the countryside. This sustainable school will be built to utilize the constraints of the slope, receding and elevating up the hillside. Each terraced level is one single floor and has high windows to capture a lot of natural daylight. Rather than remain flat, the roof undulates in gentle waves across the level for a more natural look and is covered with vegetation to blend in with the surrounding landscape.